German Chancellor Angela Merkel has set off on a visit to Latin America, after Venezuelan President Hugo Chavez linked her party to Hitler. Mr Chavez threatened to confront Ms Merkel on Friday at a summit in Peru of Latin American and European leaders. 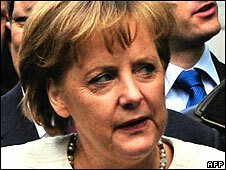 His outburst came after Ms Merkel said he did not speak for Latin America and would not affect EU relations. As well as Peru, the German leader will visit Brazil, Mexico and Columbia. "She is from the German right," said Mr Chavez. "The same that supported Hitler, that supported fascism. That's the Chancellor of Germany today." The Venezuelan leader stopped short of telling Ms Merkel to go to hell, saying: "Ms Chancellor, you can go to... because you are a lady, I won't say any more." European Commission President Jose Manuel Barroso defended the German Chancellor by suggesting Mr Chavez's remarks did nothing to promote friendly relations. "All declarations against the leaders of Europe, against someone with the personality of Chancellor Merkel, of course they're bad," he said. 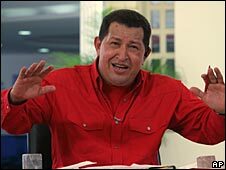 Mr Chavez is no stranger to insulting international leaders. He has called President Bush a "devil" and was told to "shut up" by King Juan Carlos of Spain after calling former Spanish Prime Minister Jose Maria Aznar a "fascist".